Cauvery Issue: The IPL venue in Chennai, MA Chidambaram stadium, turned into a virtual fortress with the deployment of 4,000 policemen. Cauvery Issue: Tamizhaga Vazhvurimai Katchi workers gathered outside the MAC Stadium. Chennai: Amid raging dispute over the Cauvery issue, workers of a Tamil outfit, Tamizhaga Vazhvurimai Katchi (TVK), gathered outside MA Chidambaram Stadium in Chennai today. The party workers are protesting against the Indian Premier League (IPL) matches being held at the stadium. After a lot of traffic restrictions around the stadium and the arrival of the teams accompanied by tight security, the toss for the game was taken at 7.43 pm, by a delay of 13 minutes. The Chidambaram stadium earlier in the day turned into a virtual fortress with 4,000 policemen including commandos and members of the Rapid Action Force, news agency PTI reported. IPL tie involving Chennai Super Kings (CSK) and Kolkata Knight Riders (KKR) is to be held at 8 pm today. Earlier, actor-turned-politician Kamal Haasan and his peer Rajinikanth also voiced concern about the Tamil Nadu capital hosting IPL Matches as centre delays the constitution of the Cauvery Management Board. Here are the highlights on the Cauvery IPL protests outside the IPL Venue, MA Chidambaram Stadium, in Chennai. After a lot of traffic restrictions around the stadium and the arrival of the teams accompanied by tight security, the toss for the game was taken at 7.43 pm, by a delay of 13 minutes. Amidst strong protests against holding the IPL match on the issue of Cauvery waters issue, the outing between the Chennai Super Kings (CSK) and the Kolkata Knight Riders began on amidst unprecedented security for a sport event. The match between Chennai Super Kings (CSK) and Kolkata Knight Riders (KKR) began in Chennai amidst protests. As the rival teams made it to the M.A. 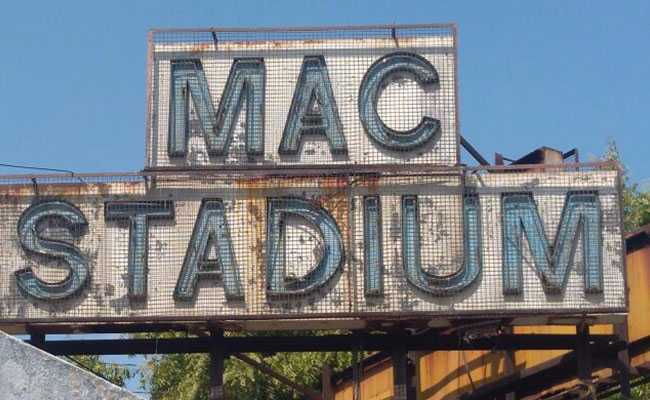 Chidambaram Stadium - popularly known as Chepauk Stadium - through the back gate, the complex turned into a fortress with the deployment of hundreds of police personnel, many in riot gear. Protests intensified in the city today against the conduct of IPL matches amid raging Cauvery demonstrations, with police chasing away agitators in some places. One incident of agitators burning yellow jerseys, the attire of Chennai Super Kings players, was also reported. 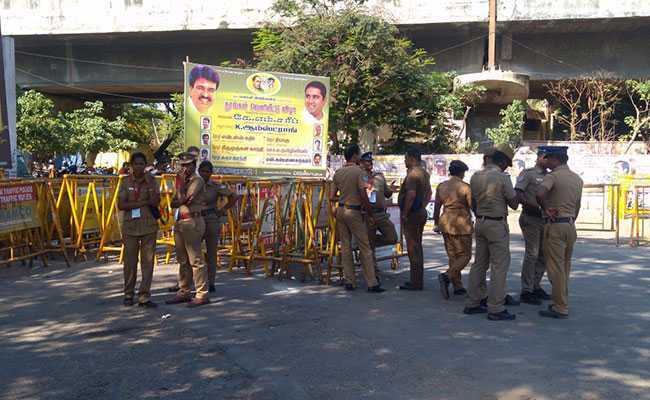 Cauvery Issue: Heavy security has been deployed at all roads leading to the IPL venue in Chennai. Political parties and fringe groups have been demanding cancellation or postponement of all seven IPL matches in Chennai till the centre constitutes the Cauvery Management Board. Read here. The central government was reprimanded by the top court on Monday for ignoring its orders on setting up the regulatory body. Over the past one week, Tamil Nadu has witnessed several protests against the delay in constitution the Cauvery Management Board (CMB) by the centre in compliance with the February 16 order of the Supreme Court. 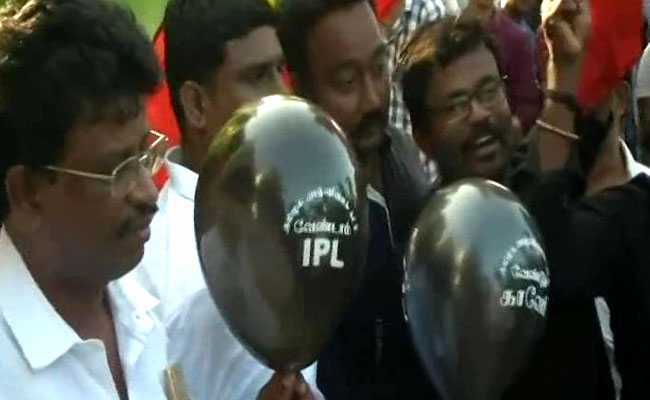 Tamizhaga Vazhvurimai Katchi (TVK) workers protesting outside MA Chidambaram Stadium ahead of the CSK versus KKR IPL match at 8 pm, carried black balloons. "We do not want IPL, we want Cauvery Management Board," the party workers were quoted as saying by news agency ANI. IPL Chairman Rajeev Shukla met Union Home Secretary Rajeev Gauba over security regarding matches in Chennai, news agency ANI reported. He was assured that proper arrangements have been made.